Aah, chocolate and peanut butter, two of my favorite flavors. 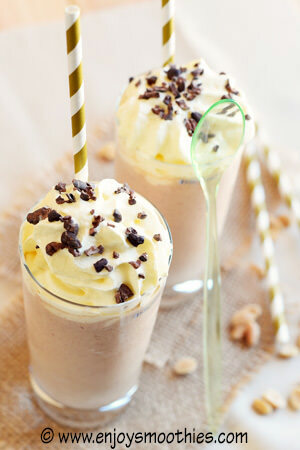 So why not combine them into a delicious chocolate peanut butter smoothie. Separately, they are yummy, but together they are divine. And to reduce the calorie load of this concoction, I used cacao for the chocolate flavor, almond milk and natural peanut butter without any added fat or sugar. 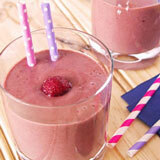 Throw in a couple of bananas and it will taste like a fudgy chocolate drink. For extra antioxidants add some berries such as strawberries or blueberries. 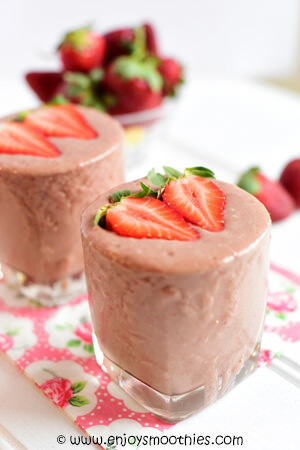 The berries also act as a natural sweetener, as cacao can be rather bitter. Another way of adding sweetness is with vanilla or honey. And so without even trying, you will have the most delicious drink imaginable which also happens to be surprisingly healthy. 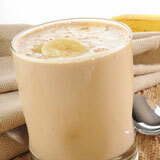 Blend together the bananas, almond milk, peanut butter, vanilla yogurt and cacao. Blend on high until everything is lovely and smooth. Pour into your favorite serving glasses and enjoy. NOTE: If you don’t have vanilla yogurt, just add some vanilla extract or paste. It will give the cacao that added sweetness. 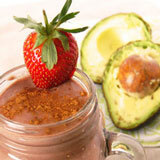 Add the bananas, strawberries, almond milk, peanut butter and cacao to your blender. Blend together until smooth then taste. If you like your smoothies a little sweeter, then add some honey. I am constantly amazed at the different combinations that can be thrown into a blender and come out delicious the other end. This is one such occasion. When I considered combining blueberries with peanut butter I wasn’t sure what the end result would be. But with the addition of the chocolate, it proved to be absolutely DELICIOUS. Who would have thought. 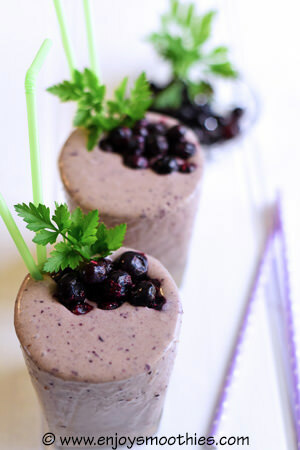 Into your blender combine the bananas, blueberries, almond milk, peanut butter, cacao and yogurt. Blitz on high until everything is well mixed and creamy.